Fresh fighting in the Gaza Strip has left at least 20 people dead over the past 24 hours, after a truce between the Fatah and Hamas factions collapsed. However, a Hamas spokesman said a new ceasefire deal had been reached and would come into force on Friday. More than 150 people have been injured in the fighting - the fiercest seen in Gaza since Hamas came to power in 2006. Middle East mediators are due to meet to discuss the embargo against Hamas and moribund peace process with Israel. The BBC's Alan Johnston in Gaza says there is no doubt that the confrontation between Hamas and Fatah has moved to a new level. Past flare-ups of violence there mainly involved light skirmishing on street corners and life could go on around them to a large degree, he says. But now the two sides are planning and carrying out much more comprehensive attacks on each other and doing so with a ferocity that makes all the streets dangerous, he adds. Reports say Palestinian Authority President and Fatah chief Mahmoud Abbas and Hamas political chief Khaled Meshaal will meet in Saudi Arabia next Tuesday to try to end the fighting. Hamas - which won legislative elections a year ago - and Fatah have been trying to form a unity government for months. They are deadlocked over Hamas' rejection of international calls that it recognises Israel. Western donors have been withholding aid, resulting in a deep economic crisis in the Palestinian territories. 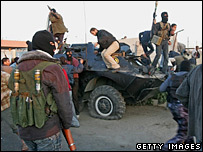 Fourteen people - including a woman and two children, plus at least two gunmen from either side and a senior member of Mr Abbas' intelligence service - were killed in clashes on Friday, bringing the death toll over 24 hours to at least 20. The truce, which was declared on Tuesday, was shattered when Hamas militants ambushed a convoy carrying equipment to the Fatah-allied security forces on Thursday. Six people died in the ensuing gun battle, triggering clashes across the Gaza Strip. Speaking in the West Bank city of Ramallah, the Palestinian leader appealed for calm. "I call upon everyone, regardless of their affiliation, to stop this bloodletting," Mr Abbas said. 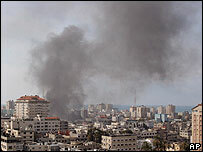 Earlier Hamas fighters attacked several bases used by Fatah or official state security services. Meanwhile dozens of Fatah fighters laid siege to the interior ministry, run by Hamas. Our correspondent said bursts of fire could be heard every few minutes. Sometimes there were much louder blasts, he said, and ambulance sirens wailed through the streets. Overnight members of the presidential guard stormed the Islamic University - long regarded as a Hamas bastion - parts of which were later set on fire. A Fatah official said seven Iranians were arrested at the university and an eighth blew himself up during the operation. Hamas denied that any non-Palestinians were inside the campus. Meanwhile the Quartet of Middle East mediators - the EU, the UN, the US and Russia - was preparing to meet in Washington. The US said it expected the group to reaffirm its commitment to agreed conditions that the Hamas government must meet to receive international aid. The Quartet has cut off funding to the Hamas government because of its refusal to recognise Israel and renounce violence. Washington insists there is still a united position of isolating Hamas, the BBC's Jonathan Beale says from the US capital. But Russia has called for the embargo to be lifted, and the UN has questioned whether the current policy can be sustained, he adds.